The Gibson Brothers are two-time IBMA Entertainer of the Year recipients and one of the hottest touring acts in contemporary bluegrass. They are set to host IBMA’s 26th annual International Bluegrass Music Awards, scheduled for October 1 at Raleigh, North Carolina’s Duke Energy Centre for the Performing Arts. Known as bluegrass music’s biggest night of the year, the International Bluegrass Music Awards acknowledges the year’s outstanding talent and achievements, honours new Hall of Fame inductees, and waves the worldwide flag for bluegrass music. Amy Reitnouer, Executive Director of The Bluegrass Situation returns to the International Bluegrass Music Awards for the second year as co-producer, alongside Rounder Label Group’s Megan McNair Bedford. Eric and I are honoured and excited to be hosting the IBMA awards this fall. When we got the call asking for our participation it bowled us over. I was filled with a warm sense of pride and accomplishment quickly followed by fear. What will I wear? Should I grow out my bangs? Will they expect Eric to talk? Brother Eric believes these are not the most pressing things to think about right now and that we should focus on making the evening as fun and energetic as the music it honours. So that’s what we’re going to do. See you in Raleigh – Leigh Gibson. This year’s awards show is all about family, community, and coming home. Who better, then, than one of the genre’s premiere families and most celebrated entertainers to emcee the biggest night in bluegrass – Amy Reitnouer, Executive Director of The Bluegrass Situation. Over the past twenty years, Eric and Leigh Gibson have garnered critical acclaim as musicians, writers and performers – causing an ever-growing legion of bluegrass fans to take notice. 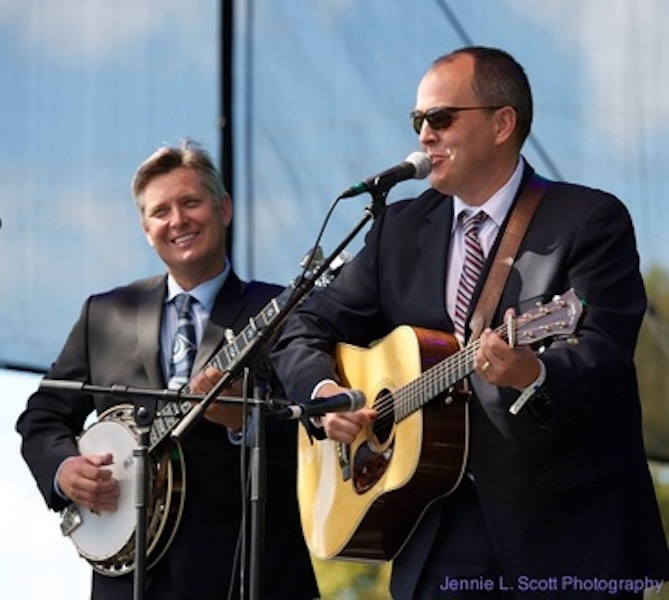 Their peers have noticed, too: in addition to earning IBMA’s Entertainer of the Year Award in 2012 and 2013, the Gibson Brothers’ celebrated history with the Bluegrass Awards includes Vocal Group of the Year (2011, 2013), Song of the Year (2010, 2013), Album of the Year (2011), Gospel Performance of the Year (2010, 2012), Songwriter of the Year (presented to Eric Gibson in 2013) and even Emerging Artist in 1998. Tickets for the Award Show, as well as for the ticketed portion of Wide Open Bluegrass (which takes place at Red Hat Amphitheater), Bluegrass Ramble Showcase passes, IBMA Business Conference registration and hotel reservations – along with additional details and pricing information – are available through IBMA’s website.